Voice search, according to Google, now accounts for a significant chunk of online retail, with people saying "Trousers" and " Loo roll" at their phones, because they're busy doing something else with their hands, or they can't spell, or something. To celebrate, the search gianthas collaborated withblokey couturier Ted Baker to roll out its MIssion: Impeccable campaign. Also on board: blokey film director Guy Ritchie and blokey social marketing experts Poke. Presumably, all concerned thought the Google boys were a right bunch of hoity-toity ponces, mincing abaaaaht, so it's good they were still able to work so closely with them. Now, pay attention, because this is quite confusing. Mission: Impeccable kicks off September 7. So you'll just have enough time to figure out what's going on before the iPhone event starts. At 14:30, a three-minute film directed by Crowns and Owls and "executive produced" by Guy 'Lock, Stock and Formerly Married to Madonna' Ritchie will go live on Tedbaker.com and Ted Baker's YouTube channel. Here's a trailer for Mission: Impeccable. I woud say it makes everything more clear, but that would be a lie. However, you will note that all the geezers in the movie are done up like it's Bryan Ferry's wedding and looking proper dapper and that. So, the clever bit is that when the full-length advert apears tomorrow, you'll be able to buy all of the schmutter there and then with just a click of your mouse or touchscreen. 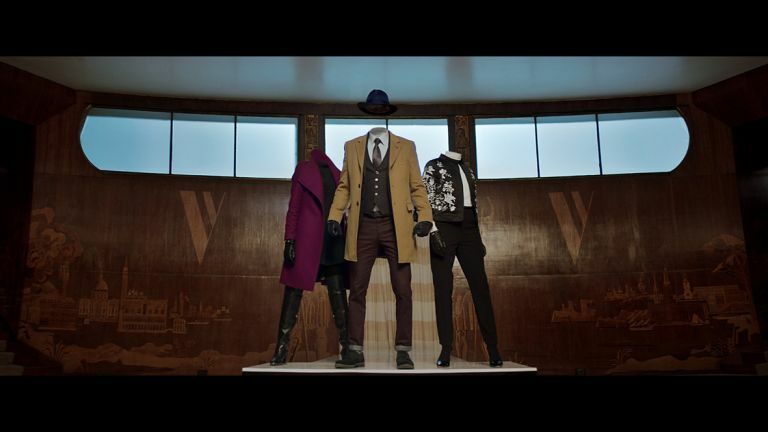 The garms will also be shoppable at Selfridge's in London and Nordstrom of North America, so you can get all fitted up with gorblimey trousers, titfer tats and a right tasty whistle and flute, guv'nor, isn't it? The tech/tailor/spy/geezer crossover cleverness doesn't end there. Go to Ted Baker's Regent Street store with a 'special ticket' and you can be among the first to experience in-store Google Search voice-controlled shopping. Yup. The store will have an 'interactive window display' containing 'secret code phrases' - "The Owl flies south at dawn," that sort of thing. Speak these into Google Search and you can WIN FREE STUFF! Ted Baker is to be congratulated not only for coming up with an excellent Autumn collection, but also one of the most baffling social campaigns of recent times. "Busting out from the chains of virtual constraint, we've taken the campaign into the physical world. Offering a more cryptic augmentation than our Pokémon friends, Ted offers a way to discover secrets in and around their stores, otherwise hidden from the naked eye. Simple, really. On your way, now.